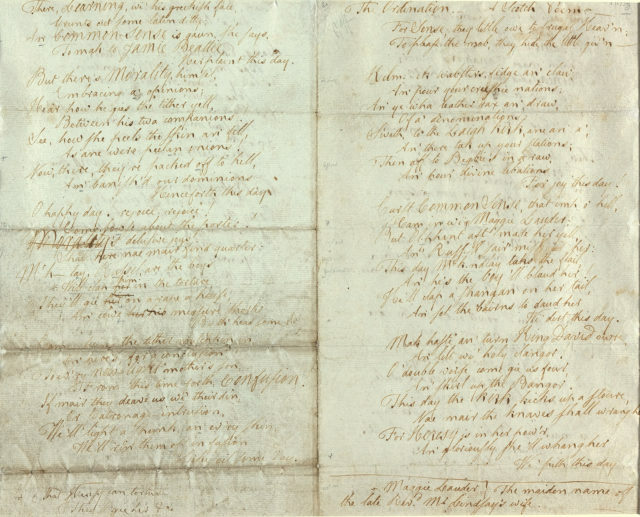 Original manuscripts of two Robert Burns poems will go on display in Glasgow on Burns Day. Holy Willie’s Prayer and The Ordination: A Scotch Poem will sit side-by-side at the National Library of Scotland’s Kelvin Hall base. The “unmissable” exhibition will be open for just four hours on January 25, and is free to visit. “Robert Burns’s poetry, songs and sentiments on the human condition continue to resonate with people the world over and some 250 years after he developed his work, this exhibition is an exciting opportunity to see two of those original manuscripts close up. David McDonald, chair of Glasgow Life, said: “Glasgow is home to some priceless treasures, not least our collection of original manuscripts and objects associated with the Bard. “To get to see not one, but two original works, albeit for a short period of time, presents an unmissable opportunity on Burns Day. Both poems explore the use and misuse of religious power in 18th-century Scotland and the exhibition also features Burns’s own explanation and background to Holy Willie’s Prayer, the 1785 satirical poem written to expose the hypocrisy of the Mauchline Kirk elder William Fisher. The Ordination: A Scotch Poem, penned the following year, is also a satirical piece on the appointment of the evangelical Reverend James Mackinlay to the Laigh Kirl, Kilmarnock, reflecting conflicts between the traditional and progressive religious ideas within the community. The poems will go on display at Kelvin Hall on January 25 from 11am to 3pm.